One of my favorite buildings is the Pennzoil building in downtown Houston. It was designed by Philip Johnson who boasted he saved his best buildings for Houston. The Pennzoil is a prime example of modern architecture focusing on geometric shapes. 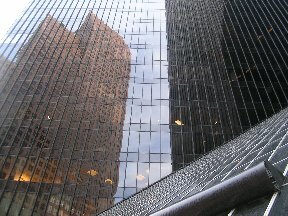 The Bank of America across the street and reflected in the glass panes of the Pennzoil was also designed by Philip Johnson and represents late Modern architecture. The Pennzoil is twin mirror-image trapezoidal shaped towers connected by triangular shaped plazas enclosed by a 45 degree glass slope. The faces are black glass and reflect not just portions of itself but the buildings around it. Depending upon where you stand, one of the towers appears markedly shorter than the other—but they are identical in size- and just ten feet apart. In sunshine or rain, the building is always wonderful. I’m working on a piece for Tactile Architecture using it as an inspiration but alas, it will not be completed in time. Perhaps next year. Sylvia, I’m looking forward to seeing your piece for Tactile Architecture. I’ve never ventured to try for that exhibit, but always love viewing it. You’ve made my blog today. Go see!